Have you ever considered how odd it is that this fictional world is ruled by a ‘king’? The writers could have selected any imagined title for the local despot, but instead they opted for a pre-existing label of leadership. Well, that isn’t the only title pulled from History. Each region of Skyrim is governed by a ‘Jarl’, which is the Scandinavia word for an Earl. It’s all well and good trying to convince the common man that they are ruled by one, single person with a fancy hat, but it’s another thing to organise. Whilst a King rules the state, his most loyal and powerful subjects would each rule a section of the country in the King’s name. These Jarls also had the chance to become the next King in the previous fellow met an untimely/violent end. Thane is also an historically accurate term. Once you have completed enough missions in a region to prove to the local Jarl that you are indeed a purveyor of awesomeness, they will bestow this title upon you. In Skyrim a Thane receives a new weapon and special friend to follow you everywhere no matter how far you fast travel. In medieval Scandinavia, a Thegn is the early version of a Knight, and could become a Jarl themselves one day. The title makes you a ‘servant’ or ‘attendant’ of the king. As with a knighthood, the title of Thegn/Thane is traditionally awarded by the King rather than the local Earl. 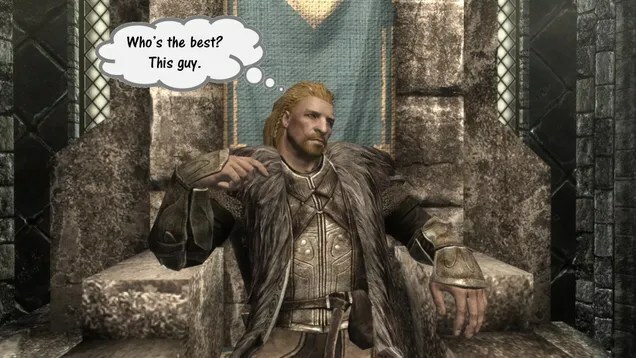 Just as a Thane in Skyrim can get away with petty crimes – so long as the bounty is low – no one except the King was allowed to pass judgement on the King’s Thegn. The only ‘inaccuracy’ that can be found with the use of these two terms is that they were, even by the middle ages, fairly primitive words. As stated, ‘Thane’ would give way to ‘Knight’ and ‘Jarl’ would switch to ‘Duke’. Perhaps the intention was to use lesser known words to give the impression of fantasy. Then again, the original word for Duke is ‘Dux’… and I think I would have preferred everyone in Skyrim calling each other Dux instead of Jarl. Spells and Wards are a big part of the combat in Skyrim. They are also, sadly, very historically inaccurate. Magic is one of those features that is accurate in the sense that History inspired it. In part 2 of this blog I argued that without the historic belief in dragons we wouldn’t see them in a fantasy setting, and the same is true for magic. Throwing fire, ice and lightning across the horizon is a bit much for most superstitious historic civilisations, but the ability to heal through magic exists throughout history. The use of healing abilities on the wounded or sick is an event witnessed throughout History. 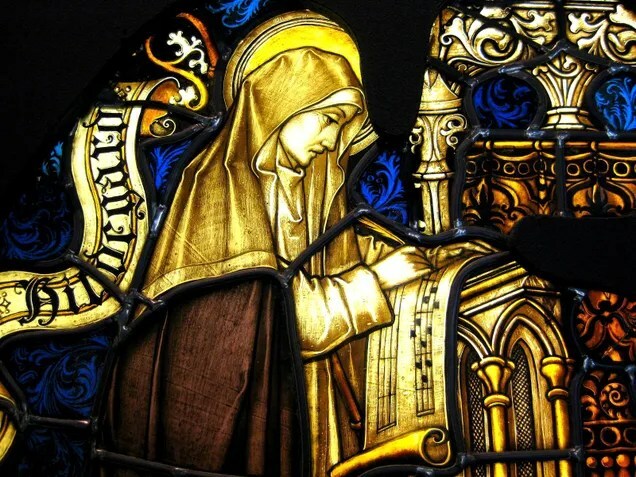 Hildegard von Bingen, an eleventh century saint, was apparently blessed with healing powers through physical touch and through a more tangible combination of herbs and stones. Yes, Hildegard’s levels in Restoration and Alchemy were pretty high. Whilst Charles II of England may not have learnt ‘Grand Healing’, he was believed to possess an equally fanciful ability: Royal touch. This ability is also where the term “lay on hands” originates from. French and England Kings had for centuries possessed the ability to heal the sick through touch, and Charles II used his ability to heal over 100,000 people during the Great Plague. Whilst the act of summoning a healing light from the palms of your hands is disappointingly far from the truth, there are countless instances in History where healing magic seemed to play a part. This is true of even more recent History. When the Russian Tsar discovered that his son was a haemophiliac, even the most expensive doctors failed to help the boy. When all seemed lost the Tsarina called on the help of the self-proclaimed holy man named Rasputin, who indeed appeared to bring the boy back to full health. Whilst luck and coincidence offer better explanations for this feat, the Tsarina was wholly convinced. There are other magic abilities in Skyrim that have roots in History – the abilities to turn or banish the undead are another example – but the ability to heal through touch or simple words is regular feature of more sensible and logical points in time. Very early on in the game, your created character is threatened with a swift head removal. In Part 1, I discussed the accuracy of this practice at length. For a long stretch of my playthough it seemed that beheading or imprisonment were the only forms of punishment available to the citizens of Skyrim. How happy I was to see a twin pair of stocks set up in the lower corner of Markarth, the most Western settlement. Medieval crime and punishment is a fascinating topic, and one that would take several blogs to fully explore. The vast multitude of ways in which the peasantry and nobility could be maimed, killed, humiliated or tortured for even the most menial crime is astounding. A low-level thief in medieval Europe risked loss of fingers, hand or eyesight, having an ear lobe or nostril sliced or having their hand or forehead marked with red-hot poker (to name just a few methods). Yet few methods of punishment were more simple and effective than the stocks. You may recognise the contraption. You might have once posed for a photo with your head and hands through the holes in the wood, trying to look guiltily and sad. Yet there is no denying that the stocks are one of the most widely used methods of punishment, and also interrogation, in history. When you have a moment, try standing like you would if in the stocks: bent forward, head down, with your arms up to the level of your neck (I’d probably warn the people you live with before you start standing round the house like this). After a while, it will start to get uncomfortable and a lot more humiliating. Now imagine you are standing like that for an hour. After a short while, everything will start to hurt, and there’s nothing you can do about it. To make matters worse, an hour is probably the shortest amount of time you’d expect to spend in the stocks. Four hours, eight hours, three days… these are all periods of time that criminals are known to have spent between these blocks of wood. And what possible crime would you have to commit to spend a whole hour in this contraption? Swearing. Yup. If you were caught cursing in medieval England, it could mean an hour in the stocks. 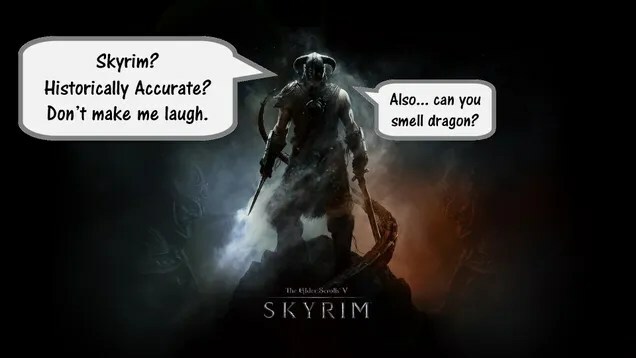 We get things easy in Skyrim. When you’re caught pick pocketing or Fus Ro Dah-ing the local population, your punishment is a restful night in the cells. Wouldn’t it be a much more effective deterrent for your character if they were physically tortured in the stock? Well… probably not… you’d just skip the hours until freedom, but it would be more historically accurate. And if the townsfolk turned up to verbally and physically harm you whilst you were bound, well that would just add to the historical experience. The windows of houses in Skyrim are incredibly small. Larger windows appear to be lots of small segments of dark glass stuck together. Once you’re inside a building there seems to be very little to see of the outside world. This makes sense from a game creator’s perspective – interiors don’t have to be loaded until necessary – but there is also historical accuracy to this: making glass is hard. A medieval; craftsmen would often have one particular skill that they honed in order to make money. We can’t all try our hand a bit of blacksmithing whenever we feel like it (and there’s certainly no real chance in mastering metalwork after hammering together a few necklaces). Glassmaking is a new skill altogether, and given that most medieval houses coped with wooden shutters, learning to make glass was rarely a way to make money. We think of glass as smooth, clear and colourless, but Anglo-Saxon glass usually had a distinct blue-green colour and a rough, bubbly surface. 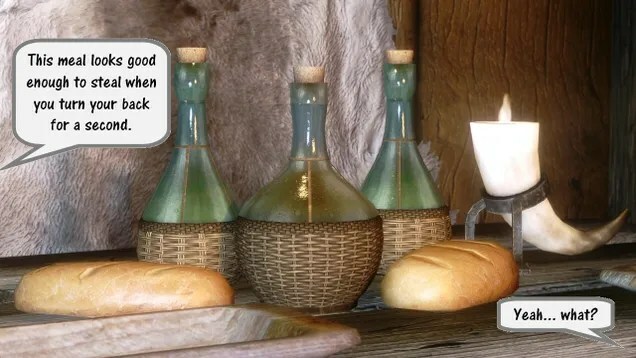 The wine bottles in Skyrim are perhaps the most accurate examples of what medieval glass would look like. Impurities in the mix and the basic nature of the technique would mean that clear glass vessels were near-impossible. It’s also the main reason why most medieval vessels are deliberately coloured; to hide the murkiness of the material. So glass is much more common in alcohol-holding form than as windows throughout history and in Skyrim. Those lattice windows are also very common in the homes of medieval nobility. The thin and rough characteristics of the glass meant that large panes of glass were out of the question. However, the main form of glass in early medieval Europe was neither windows nor bottles. Glass was more often used to make beads and decorative pieces in jewellery. The logic is pretty straightforward here: whereas in Skyrim precious stones and jewels seem to be more widespread than food, in the real world the average person would need something cheaper and more obtainable to make themselves look pretty. So this game continues to tease out historic nuggets amongst the magic and mayhem. So much so, that a Part 4 is surely on its way. For one thing, I’ll probably need to comment on how everyone in Skyrim is far too healthy all the time. Either way, I hope you enjoy these tangents from Gaming into History. I’ve had a very family-orientated Christmas this year, and haven’t been gaming or blogging all that much for the last two weeks. I hope to be writing on a weekly basis again. May that news bring you joy and/or dread. Happy New Year! My apologies, I was commenting on the glass images and someone asked me a question, I’m unable to see any conversations anymore. Not sure what setting of mine is doing that… but because I don’t want to ignore a question I will answer it with a fresh post.. please forgive me for that lack of continuity. Whoever asked, please feel free to IM me on facebook and I will show shots. I’d say the skins are the same.. the bottles are kind of opaque and look like they have the dregs of the wine stuck to their inside walls. Without High res the bottles in the arrangement look flat.. like paper cut outs stuck over the environment, with High res they seem more 3-D rendered.. like they fit in the environment. At least to my eye. Were you replying to a comment on my blog here or on Kotaku?